1.Cut the banana in to two and boil it in the pressure cooker or roast it in the flame till the skin becomes dark. 2.Let it cool,peel off the skin and grate the raw banana and keep it aside. 3.Heat a pan with one tsp of oil and roast the urad dal,tur dal and the red chillies.Fry until the dals become golden brown.Let it cool completely. 4.In a dry mixer powder the raosted dals,chillies,salt and asafoetida..
6.Add the grated raw banana and whip for a second. 7.Do not over grind it.otherwise it will become a thick mass. 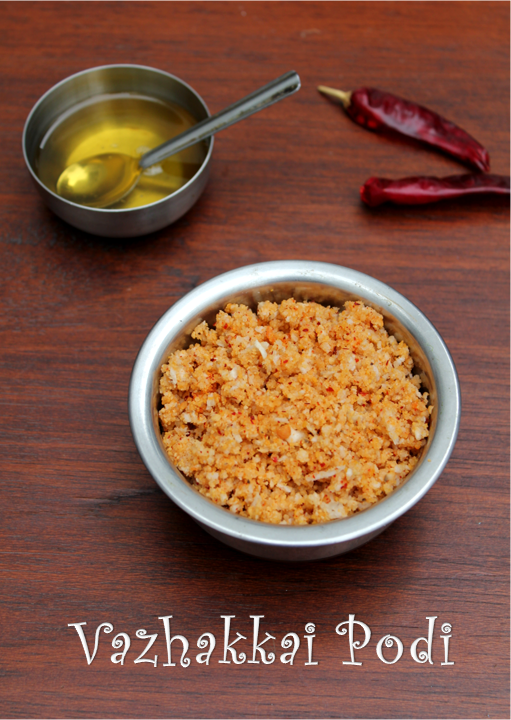 Enjoy the podi as accompaniment for rice or as you wish. 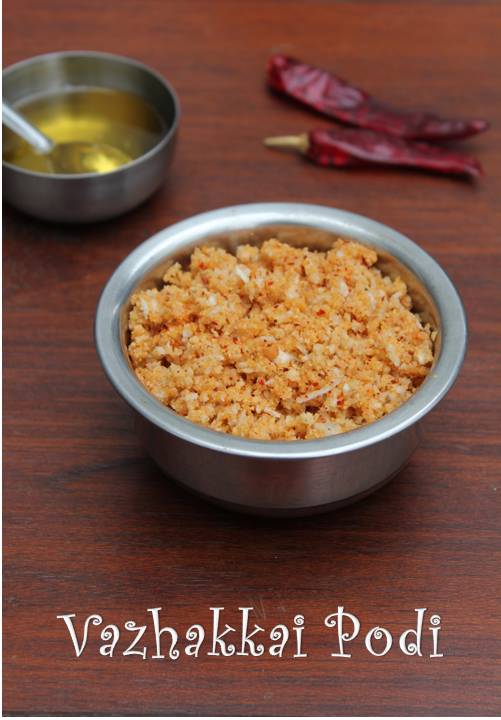 It can be substituted for a thogayal when you are making Mor Kozhambu. It can be kept in the fridge and used for few days. Use dry mixer and dry vessel to store it. Hi uma, thanks for sharing grandma's recipe . Hi Uma, my mom has always had one more step for this recipe. Heat 1 tbsp coconut oil, splutter mustard seeds and curry leaves. Once ready add the podi to it along with fresh shredded coconut and stir until it is steamy.